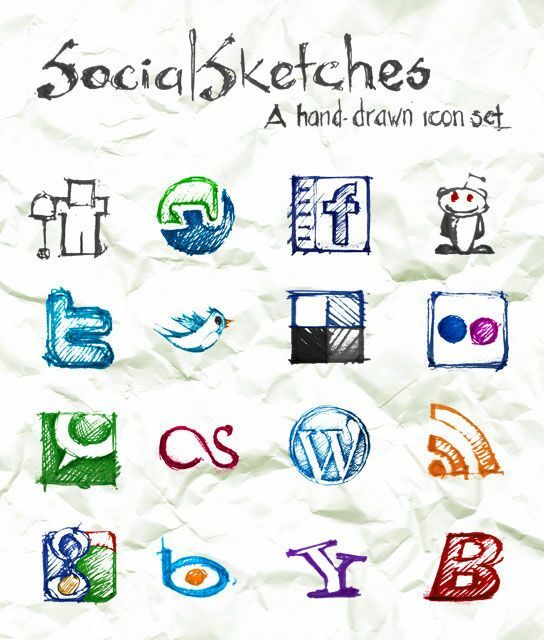 Social Sketches is a free icon set containing several icons of popular social networks exclusively released here on Six Revisions. Social media is a huge part of internet marketing, so a nice icon set on your website is a great start to getting people to your social media pages. All the icons are done in sketch style, which brings them a new look and makes them especially fit for grunge/hand-drawn themed websites; in fact, the set was created initially for use in Referrer Detector plugin on The Daily Faces, my new “daily sketch” project, but then I decided to release it for public use. Simple web design such as this icon set can make a huge difference of user experience on your site! Icon sets are great for small businesses such as an electrician using social media because they can get away with a using a free design, yet still have a nice site! This set is licensed under Creative Commons: Attribution (attribution specification: none required, but appreciated), which means you can use them for any purpose, anywhere, any time, personal and commercial alike. In the package, you’ll find 16 different icons for Digg, Reddit, StumbleUpon, Facebook, and more. Each icon comes with 6 standard sizes (32px, 48px, 64px, 128px, 256px, and 512px) in PNG format. An Phan V?n, a 25-year-old guy from Vietnam, has a great passion in web and design stuff. He has a blog called phoenix.heart that covers web design and programming. He’s the founder of Thica.net, a Vietnamese poetry network, and a new sketch project called The Daily Faces. You can reach him via Twitter, LinkedIn, and Facebook.